Mmmm it’s been a while since I’ve posted a recipe, but I think this recipe will make up for it! 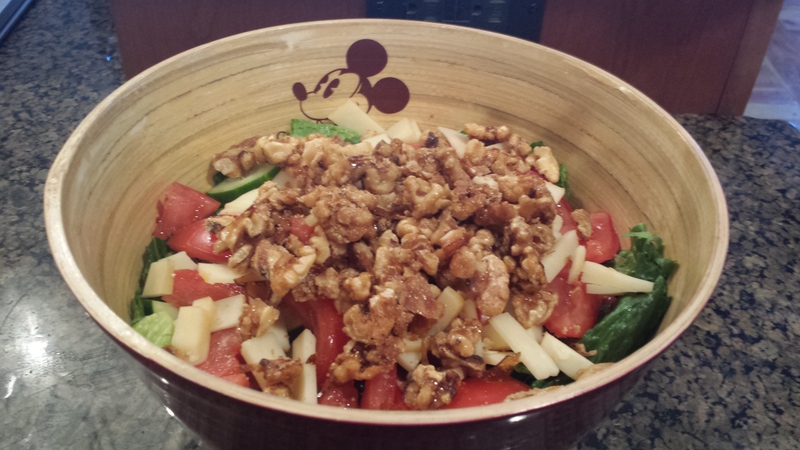 If you’re a walnut fan, oh oh oh get ready to fall in love with this salad! With just a little bit of prep, you can quickly sit down and enjoy this on a warm summer night. It’s perfect with a tall glass of iced-tea! First, let’s start with the walnuts! Make sure to use a non-stick baking sheet to get the syrup to crystallize and break apart, like candy pieces. I love to cook, but the clean up drives me bonkers, so whatever shortcuts I can use, I totally do. So, since you need to prepare the walnuts two ways, I cooked the dry walnuts that needed to be roasted for the vinaigrette on one half of a baking sheet, and the candied walnuts on the other. Roasted to the left, candied to the right. I can’t pick a side. It’s all sooo good! 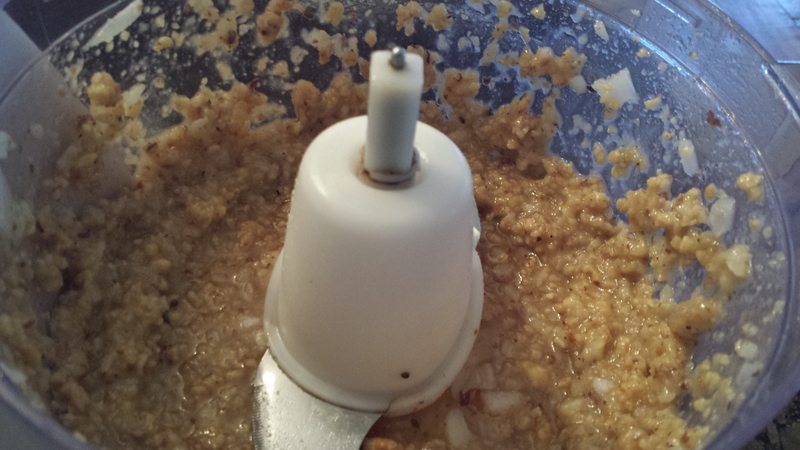 As usual, I used more walnuts than the original recipe calls for. 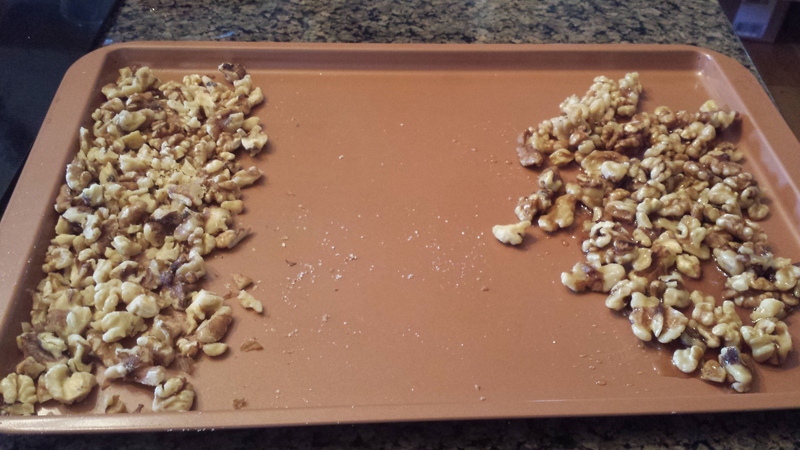 I took 1/2 cup of walnuts and spread them out evenly on the baking sheet. These would be roasted for the dressing. Then, I took another 1/2 cup of walnuts, roughly chopped those, and tossed them in a small bowl with about 3 tablespoons of good maple syrup. Just make sure you have enough maple syrup to coat the walnuts, we don’t want the swimming in syrup! 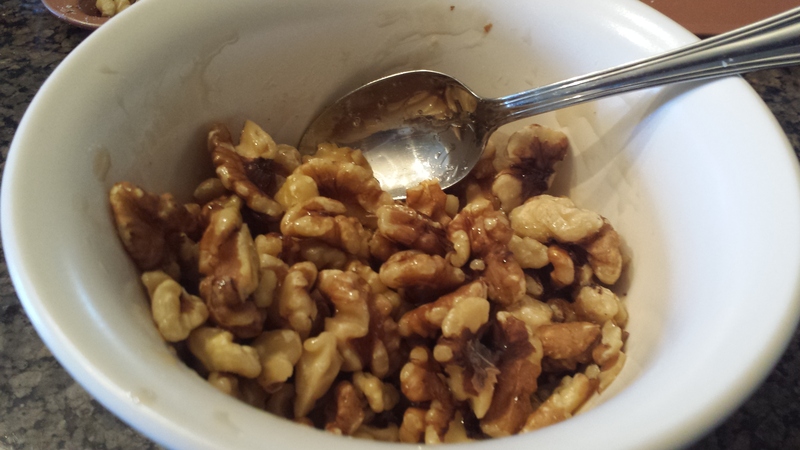 Put the walnuts into a 350º oven for about 10-15 minutes. Keep checking the walnuts! They go from roasting to burnt very quickly. The candied walnuts may become a big gloppy piece of sugars, nutty goodness. I treated this in a brittle-like manner, and randomly broke big and small pieces off once it had cooled down on the baking sheet. Put the candied walnuts aside for later. The roasted walnuts are now added into a food processor, along with 1/3 cup honey, 1/4 cup white vinegar, and about 1/4 cup of chopped onion. 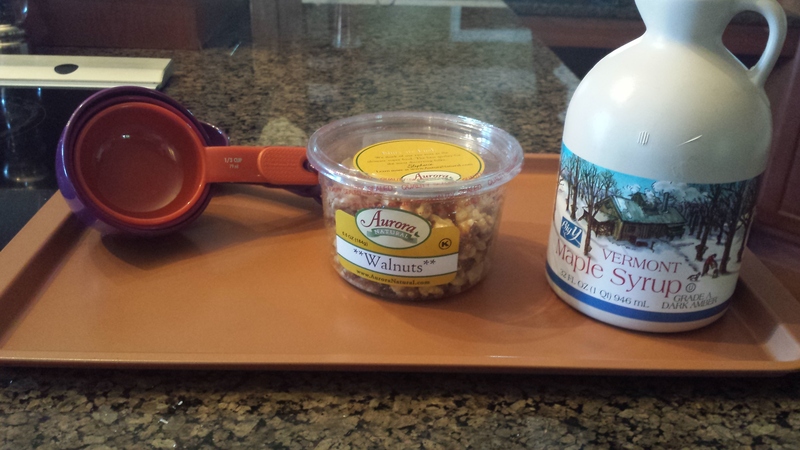 Pulse these ingredients together until the are thoroughly mixed, and there are no large pieces of walnuts or onions. Taste the dressing and adjust. I actually added a little extra onion, even though my first thought was that adding onions would be too strong a flavor. But, if you have a stronger onion, you might want to add less, or maybe you like it sweeter and want to add more honey. It’s really up to you to adjust the dressing at this point, to your liking. Be sure to pulse the vinaigrette each time you make an adjustment. Once the dressing is to your liking, you want to put the food processor cover back on, and while it’s running, slowly stream the olive oil (about 1/4 cup) in to the mixture through the opening. The vinaigrette should be smooth and a little loose, but not too runny. The smell of this vinaigrette is intoxicating! Now, it’s time to build the salad. 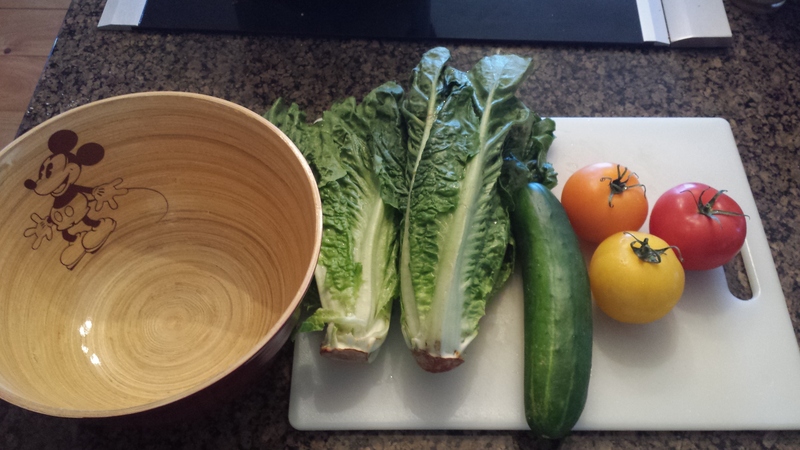 Notice the usual suspects: Romaine lettuce, a cucumber, and a couple of different colored tomatoes. You can customize this how you like, but I would suggest that you incorporate some wonderful apple-smoked cheddar cheese slices into the salad, whichever brand you like. The vinaigrette and candied walnuts are sweet, and the vegetables add a crisp, clean taste. But by adding this cheese, you bring in a smoky, deep, tart element, and paired with the above ingredients, it was absolutely heavenly! If you’re not a cheese fan, I would suggest chopping up some apples, like a tart granny smith or golden delicious.